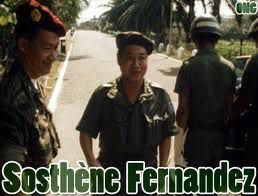 General Sosthène Fernandez was the commander-in-chief of the Khmer National Armed Forces (French: Forces Armées Nationales Khmère) and chief of general staff after Norodom Sihanouk was deposed as head of state in 1970, and is of Khmer Krom-Filipino descent. Prior to 1970, he was a prominent politician and a former chief of the police. General Sosthène Fernandez and Lon Nol left the country before the Khmer Rouge took Phnom Penh in 1975. All the republicans wanted to stop the Civil War in Cambodia. Several others officials such as Long Boret, Lon Non and Prince Sisowath Sirik Matak remained in office until the Khmer Rouge captured Phnom Penh on April 17, 1975. They mistakenly thought that they would be spared through the intercession of Norodom Sihanouk, but were executed by the Khmer Rouge. Undoubtedly, General Fernandez was an important figure of Cambodia's war against the red Khmer. He is a part of Cambodia History and said to be very influential General that couldn't continue the fight against the Khmer Rouge, Viet Cong and North Vietnamese. In 1975, because of the cut of US aid, all the republican government's leaders wanted to stop the war without conditions. Whereas, General Fernandez Sosthène refused to negotiate with the Red Khmer if the government would impose to his army's soldiers (FANK) to lay down their arms during the negotiation; for this reason he resigned. He agreed to step down as army chief. The government let the Khmer rouge take Phnom Penh without real battle for the purpose of negotiation. In 1998, General Sosthène Fernandez came back to Cambodia to meet his former soldiers and all Cambodian citizens. He has written a book about his life as the Cambodian in Chief of the Khmer National Armed Forces. .. and many more books.